I used my homemade hemp milk for this drink, but any milk of your choice would work, even cow, goat or sheep’s milk, if you’re not vegan or dairy intolerant. It’s a simple process of bunging everything into a blender and blitzing. If you’ve got a good blender, you’ll get a super smooth drink. I use my Froothie Optimum 9200A power blender which does just that. If you can’t find mesquite powder, maca powder works in this salted caramel chocolate milkshake almost as well. Using raw cacao powder gives the benefit of additional nutrients, but if you’re not fussed, cocoa powder would be fine. A delicious sugar-free drink which feels indulgent and satisfies sweet cravings, but is really quite good for you. Put everything, except the chocolate, into a power blender and blitz for 30-40 seconds - I used a Froothie Optimum power blender. Pour into a tall glass and top with a grating of chocolate if desired. Ice can be added to the blender ingredients for an even longer and cooler drink. For other cocoa inspiration, head over to my chocolate drinks board on Pinterest. You’ll find plenty of ideas there. Thanks for visiting Tin and Thyme. 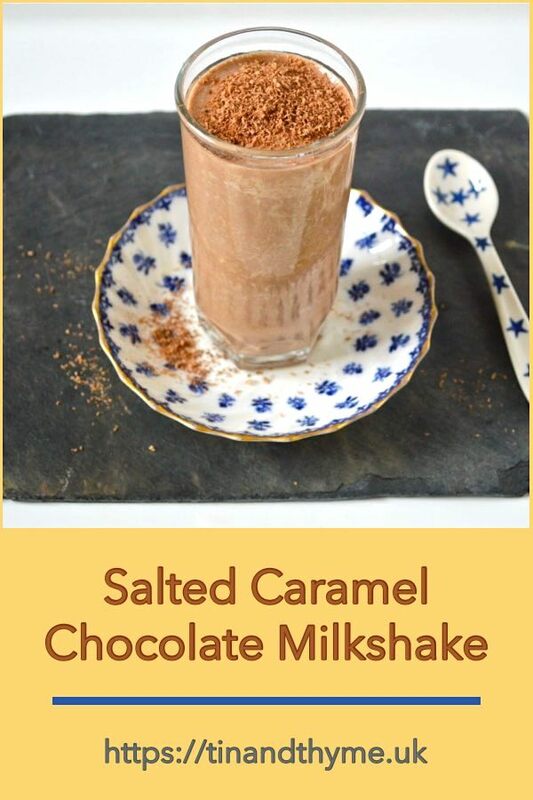 If you make this salted caramel chocolate milkshake, I’d love to hear about it in the comments below or via social media. Do share photos on social media too and use the hashtag #tinandthyme, so I can spot them. For more delicious and nutritious recipes, follow me on Twitter, Facebook, Instagram or Pinterest. Salted Caramel Chocolate Milkshake. PIN IT. I use a Froothie Optimum power blender for smoothies, spreads, sauces and even chocolate making. The post contains affiliate links. Buying through a link will not cost you any more, but I will get a small commission. This helps keep Tin and Thyme blythe and blogging. Opinions are, as always, my own. What a unique chocolate milkshake! I love hemp milk..even more than almond milk. I think I’m with you there Angie. It’s certainly one of the nicest non-dairy milks I’ve tried. This looks lush, I must try plant milk as I’ve no idea what it tastes like! Some taste a lot better than other Camilla. I’m not particularly keen on soya milk. Well each to their own of course Emma, but it’s worth trying dates as a sweetener; they do transform into something different when blended and give a flavour of caramel. I love dates for sweetening, I use them a lot in smoothies. This looks so indulgent and yet healthy too! Yes, dates are king. I grew up on them as a healthy snack; sugary sweets were frowned upon. I am very intrigued by the mix of ingredients you have here! The milkshake sounds absolutely amazing. Homemade hemp milk?? You are incredible! totally in love… would it be wrong to have a bath in this? I think not but as the chocolate expert I bow to your decision! Wow this looks so good and is made from such healthy ingredients! I’ve never tried hemp milk but I love date caramel. Ah yes Lucy. It was you that got me thinking about dates having a caramel flavour. They do of course, but I’d never really thought about it until I saw your post. Thanks Andrea. Of all the non-dairy milks I’ve tried hemp is one of my favourites, though coconut is good and homemade almond is hard to beat. What do you tend to drink? Love the idea of a healthy chocolate caramel milk shake – delicious. You had me at Salted Caramel… I am intrigued by this and definitely want to try it out sometime! Sounds utterly delicious – anything with salted caramel is a good thing! Join the club. Salted caramel is up there with my all time favourites. Seriously healthy and looks delicious Choclette. I’ve made a few smoothies with added cacao powder recently. It gives a serious flavour hit! Do the dates in this really break down to a paste so that there are no ‘lumpy’ bits?? Thanks Kate and apologies for the delayed reply. I’ve been away on holiday, to your part of the world in fact or close by. Just catching up now. I guess it depends on the power of your blender as to whether you get lumpy bits or not. Mine blends pretty much anything to total smoothness and there were definitely no bits of dates to be found. Not sure what is mesquite powder but this sounds absolutely delicious! Hi Diana. Mesquite powder is the ground up pods of the Mesquite tree which comes form the US & Mexico. It can be bought in health food shops, but you could always replace it with maca powder. Sounds delicious and quite easy to make. Will definitely give it a go. Thanks Isabel. It’s very easy to make and tastes good too 🙂 Do let me know how you get on. Mmmm. so very true. I love dates and when I eat them I always think of Laurie Lee walking to Spain with his pack of dates.